This entry was posted on March 15, 2019 by MAV Europe. We are pleased to offer you again an exclusive Ayurveda consultation and individual, authentic Ayurveda pulse diagnosis with a leading Indian Ayurveda expert. With Vaidya Prathmesh Vyas, an Indian ayurvedic scholar in fifth-generation and graduate of the Ayurveda Universities Nagpur and Rajasthan. With Vaidya Vyas we could recruit a very experienced specialist in the ayurvedic pulse diagnosis "Nadi Vigyan". Let Vaidya Prathmesh Vyas advise you individually and sensitively, you will receive many tips about the optimal ayurvedic nutrition and a truly health-promoting lifestyle. Meet Vaidya Prathmesh Vyas in person in May. Dates are 01. and 02. May in The Netherlands (Lelystad / near Amsterdam) and in Germany (Ludwigsburg) on 07. and 08. May. Already now you can book an individual 30-minute consultation (cost: 90, - Euro). Vaidya Prathmesh speaks English, in Germany a translator will be present. 9:00 a.m. to 12:30 p.m. and 2:00 p.m. to 5:00 p.m.
at the practice of Drs. Gerrit Jan Gerritsma. Drs. Gerritsma is a medical doctor and a trained Maharishi Ayurveda physician. He is a member of the AVIG (Physicians' Association for Integrative Medicine) and of IMAVF (International Maharishi Ayurveda Foundation). 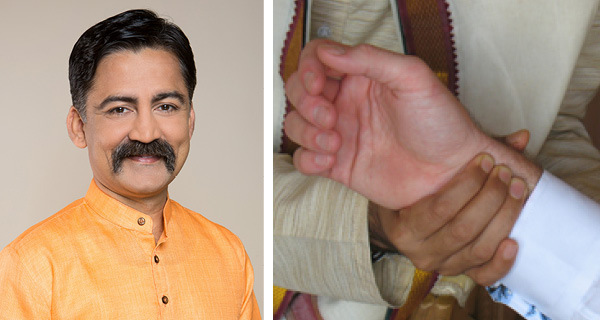 Before founding his own practice for integrative medicine in Lelystad/Netherlands in 2004 he had already been working as ayurvedic physician in different spa resorts in Germany and Austria for more than 10 years. Registration and appointments: +31 320 218081. 9:00 a.m. to 12:30 p.m. and 1:30 p.m. to 6:00 p.m.
practice for naturopathy and ayurvedic medicine of Sabine Deutscher. Ms. Deutscher studied Ayurveda in Europe and India. She completed her Ayurveda studies with a Master of Science. Registration and appointments: +49 7141 5055282.